FROM THE FRONT DOOR, TURN LEFT AND THE BEACH IS RIGHT THERE, TURN RIGHT AND IT'S JUST A QUICK WALK ON THE BOARDS TO THE POOL. Bright and airy oceanfront townhouse is perfect for your family vacation getaway. Ocean Glen is a small, quiet, 38 unit complex located on the barrier island of Bogue Banks. It is nestled in the maritime forest right next to the 200 acre Teddy Roosevelt Preserve. No high rises here. Beach is wide and uncrowded. Friendly, family atmosphere. You can meet and mingle with the other Ocean Glen vacationers or maintain your privacy - the choice is yours. Our beach home is very clean and attractively furnished. 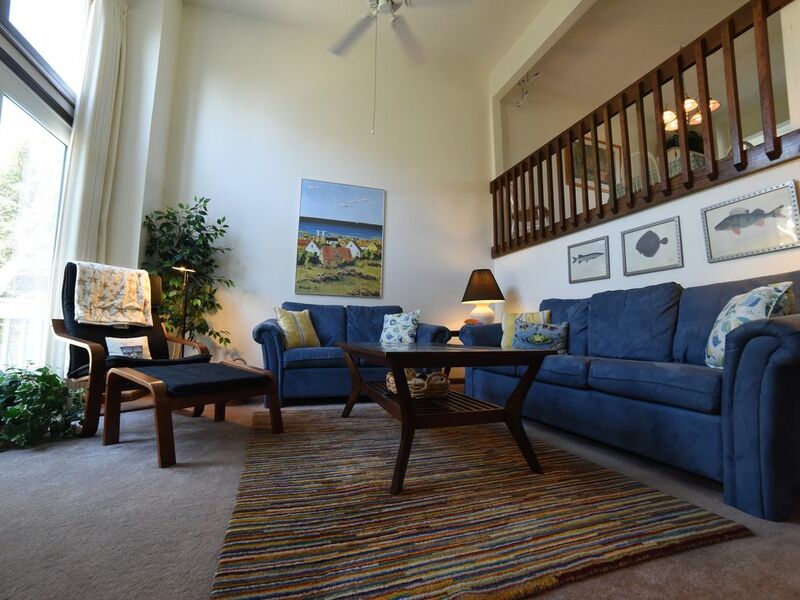 Many of our renters have commented on how really nice our place is. The Master Bedroom has a full private bath, queen-size bed and balcony WITH WONDERFUL VIEW OF OCEAN, BEACH AND TEDDY ROOSEVELT PRESERVE. AT NIGHT YOU CAN SEE THE CAPE LOOKOUT LIGHTHOUSE FLASHING IN THE DISTANCE. There are two other bedrooms - one with two twin beds, the other with a full. These rooms share another full bath. Downstairs there is a fully-equipped kitchen, dining room, sunroom, large living room, plus a half bath. As the beach is south-facing, you can relax on the deck and watch spectacular sunrises or sunsets or spy a dolphin or two. Although Ocean Glen is secluded and quiet, it is not off the beaten path. Within one mile there are restaurants, amusements (miniature golf, bumper boats and go carts), shops, kayaking, parasailing, jet-skiing, gas station, library, and post office. Also, the North Carolina Aquarium is only half mile away, located in the Roosevelt Preserve on the bay side of the island. They offer varied activities all year round for all ages (the On- Board Cruise is our favorite) plus walking nature trails. We started coming to Ocean Glen as renters in 1991 with our young sons. We liked it so much, we kept coming back (sometimes twice a year) until we finally purchased our place in 1996. We have tried to make our beach home a pleasant and relaxing place to be. Please e-mail us with your questions or if you want to see additional pictures. Come give North Carolina’s Crystal Coast a try. We know you’ll like it here and look forward to visiting again and again. Just steps from our door to the beach. Maximum 2 cars. Sorry, but HOA rules prohibit parking of boats, RVs, trailers, etc. on the property. Bring your tablet or laptop. Connect automatically. Recently remodeled, new stainless steel appliances, granite counter, farm sink, fully equipped for your vacation stay. We have 3 TV's total including a large flat screen HDTV in the Living Room. We have a variety of children's beach toys - buckets, sand forms, shovels, etc. I know its old school, but we have a VCR with a large library of children's tapes. We also have a DVD player. The balcony is off the Master Bedroom and overlooks the ocean, beach and Teddy Roosevelt Preserve. Pool open from Memorial Weekend to first weekend in October. Thanks for sharing this lovely vacation home with our family. Very clean, comfortable and only a few steps from the beautiful sandy beach. Loved it, great access to the beach and very comfortable. Janet is a great communicator. Just like the pictures, clean, well-decorated and comfortable. We had a great time in Pine Knoll Shores. Our place was very comfortable and pretty convenient to everything. We spent part of every day at the pool which was large, very well furnished with seating and usually not crowded. Everything worked fine except for the TV which we couldn't seem to figure out all the time. Not as many steps down to the beach as we feared, so that was good. I'd love to come back! This was our second year at this townhome and it was as perfect as it was last year. The location between the ocean and the pool is ideal, letting us hear the ocean while we were inside and letting us travel back and forth between beach and ocean. The home was stocked with a beach umbrella, boogie boards, and beach accessories. We plan on visiting again next year! We stayed here the week of July 4th with our 3 kids between 5 and 12. The house layout was great for our needs and access to beach and pool steps away. Loved that they had beach chairs, umbrella, sand toys all in good shape. The area also has lots of other activities which take kids enjoyed - mini-golf, ferry to Shackleford Banks etc... Clean, well stocked nice home, hope to be coming back soon! We had a wonderful stay! The location is ideal, right on the Atlantic Ocean and with a nice pool for the times you're not in the ocean mood. The condo itself is very comfortable, well-maintained, and tastefully decorated with a beachy feel. The kitchen is stocked with items you might need including a dishwasher, there is a washer and dryer right downstairs, and there are beach chairs for the important part of the day. The A/C kept the place comfortable. Truly a perfect rental, we wouldn't hesitate to rent it again! FAMILIES ONLY -- NO SMOKING -- NO PETS Saturday to Saturday rentals only during the summer. You need to supply your own sheets and towels or they can be rented from rental companies on the island.